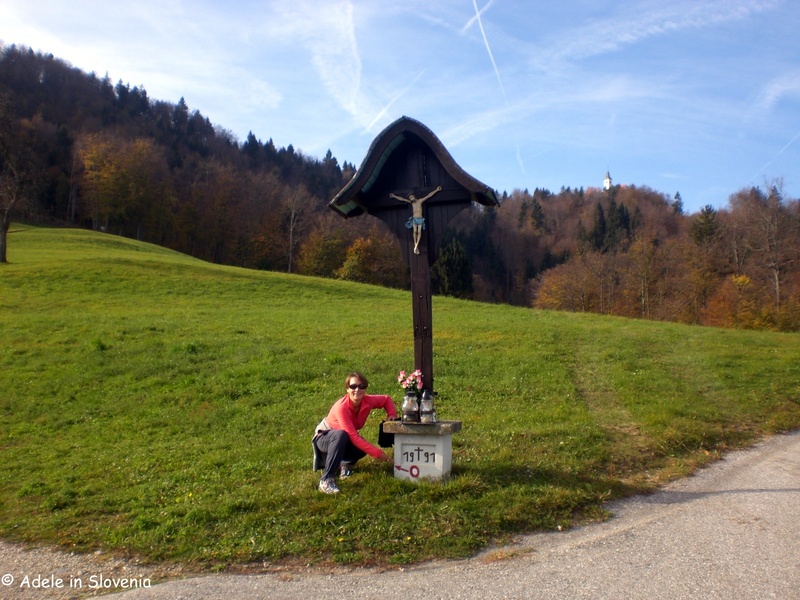 Križna Gora above Škofja Loka – Hiking, Cycling, Great Views and Heavenly Food, Too! 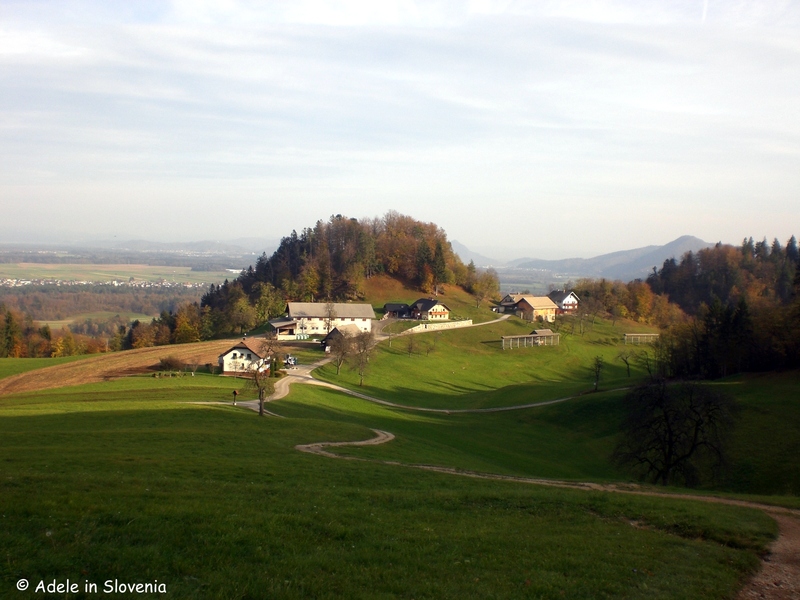 Križna Gora is a hill that rises to 681m in close proximity to the centre of Škofja Loka and is a very popular hiking and cycling destination among locals and visitors to the area. 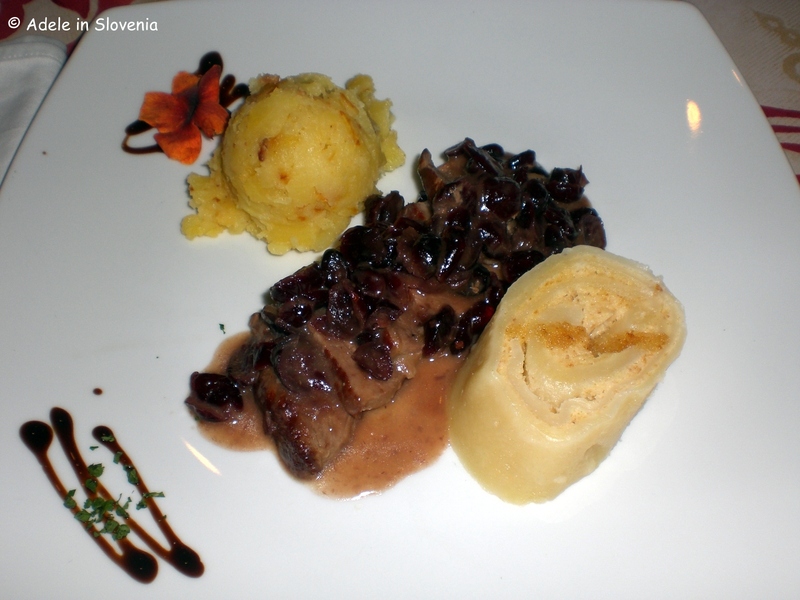 It is also home to an excellent restaurant – Gostilna pri Boštjanu, which I can highly recommend from first-hand experience. Read on to find out more! At the top of the hill stands the Church of the Holy Cross (Sv. 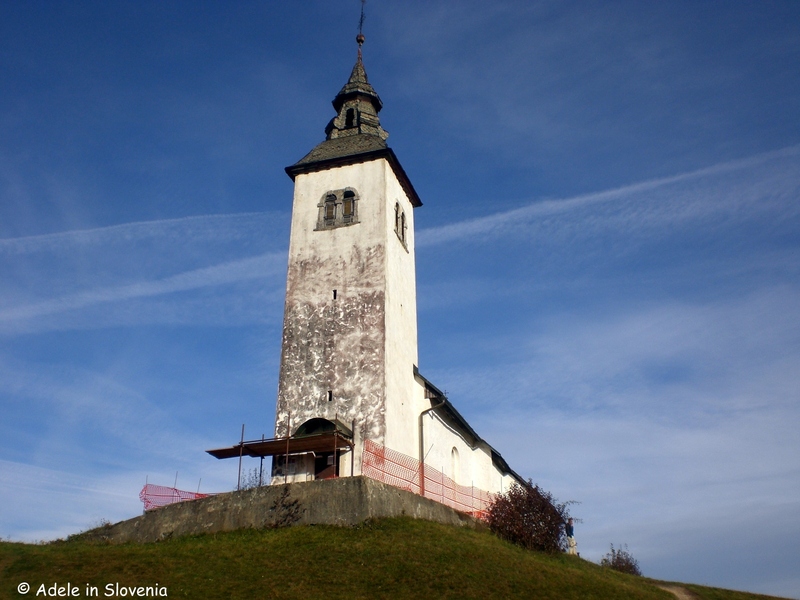 Križ), built around 1500, and the area is also the site of a mass grave and an unmarked grave from World War II. The church contains well-preserved frescoes. At the time of my visit (late October 2017), access was limited as the church is currently undergoing restoration work to repair the roof that has been leaking water for the past few years. 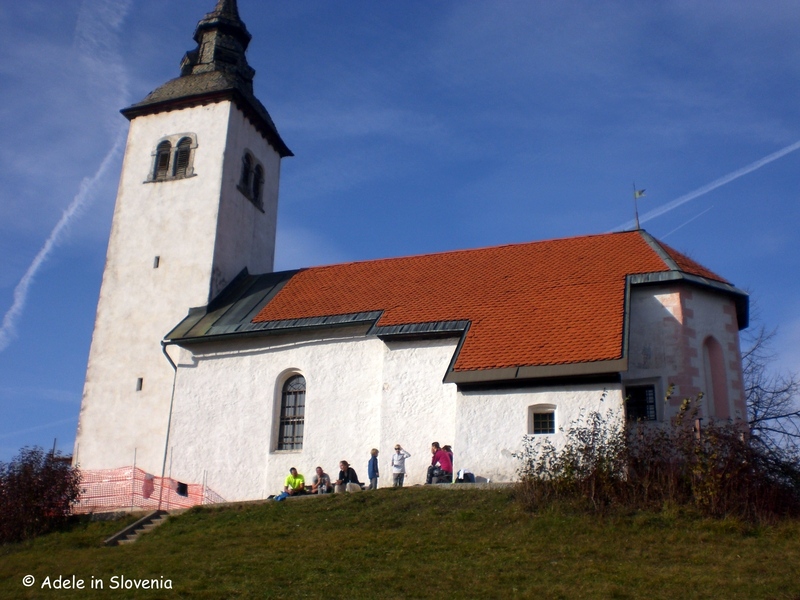 Should you wish to see the interior of the church, contact the Škofja Loka Tourist Information Centre. 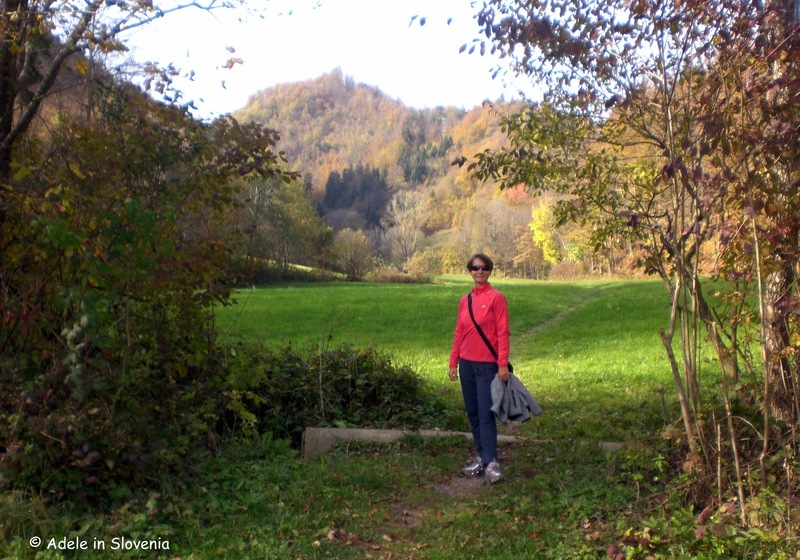 To reach Križna Gora on foot the path begins opposite the Mercator supermarket in Podlubnik, near Trnje, where there is a parking area. From the car park cross the main road and continue ahead along the fairly narrow tarmac road through the village of Trnje. After a short distance take the right fork that leads slightly downhill where the tarmac ends and becomes a gravel track where there is a red sign showing 1 hour to Križna Gora. The path first crosses a field before reaching a fairly steep path up through the forest. Hereafter, the path is well marked with the usual Slovenian system of signs – a red circle with a white inner – which are found in various places – on trees, rocks, and, as seen below, even on shrines. 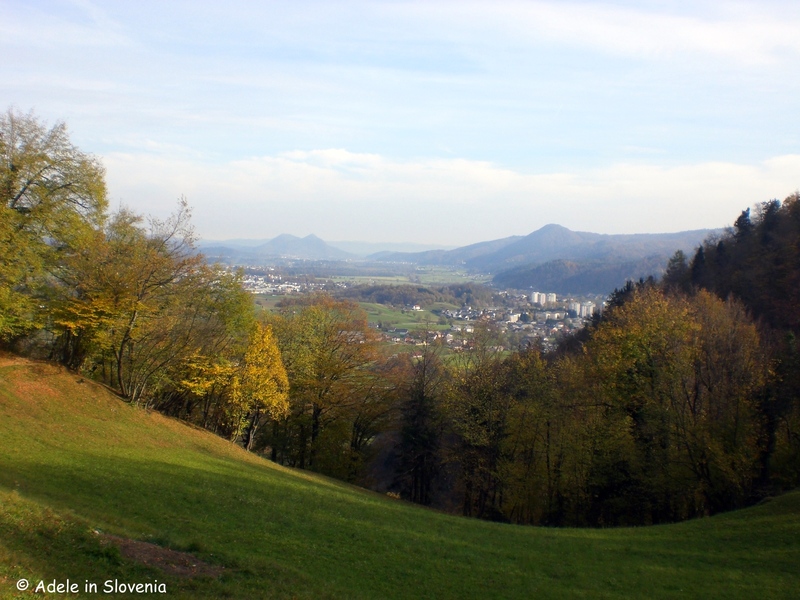 After around 15 minutes of hiking, you emerge from the forest for a great view back over the town of Škofja Loka. 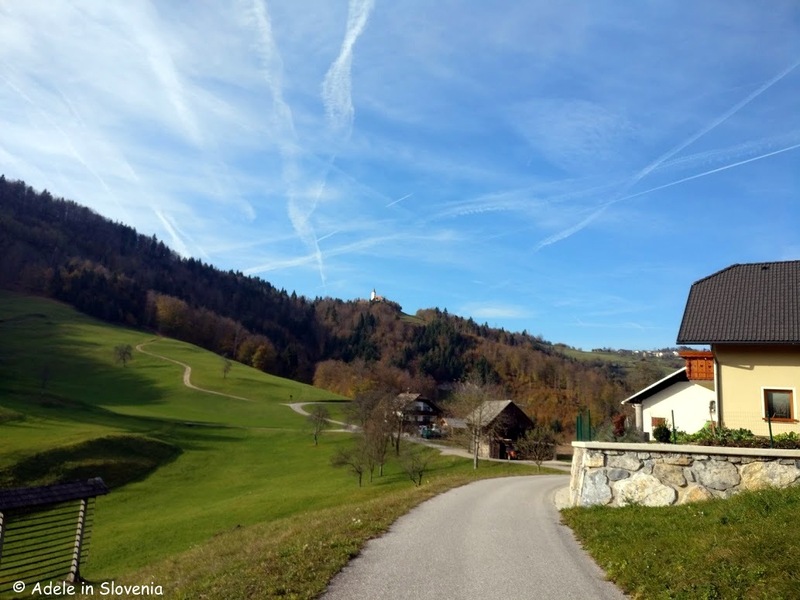 Then ahead in the distance you catch sight of the church and your destination – Križna Gora! 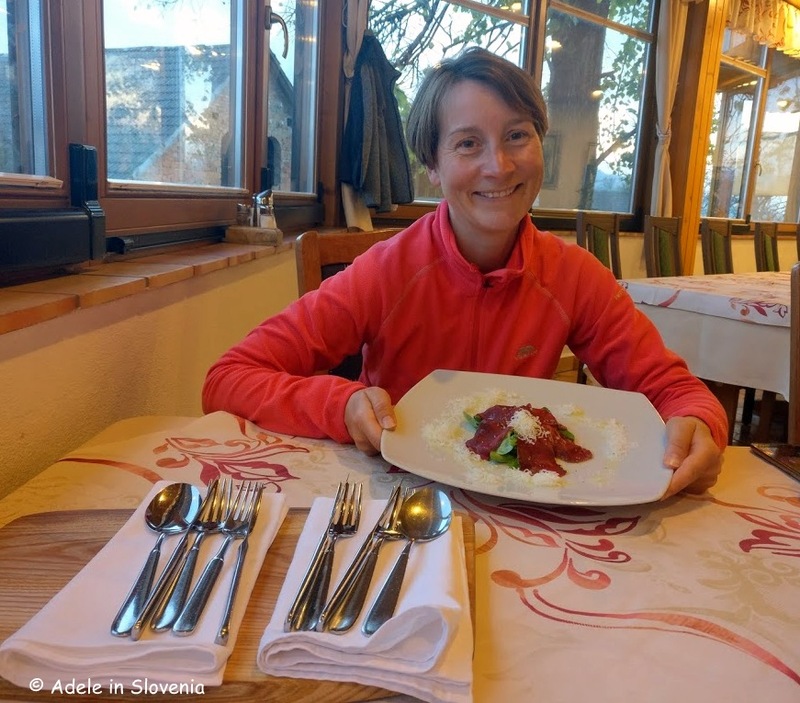 However, people don’t just flock to Križna Gora for recreation and the great views, oh no, they also know where to go for some of the tastiest local Škofja Loka food, and now I do too! Gostilna pri Boštjanu is part of the project ‘Tastes of the Škofja Loka Countryside’ (Okusi loškega podeželja), the aim of which is to acquaint visitors with traditional foods and dishes from Škofja Loka and the surrounding valleys, and in doing so preserve them for generations to come. The focus is on homemade, local food with an emphasis on tradition and innovation – past and present. There are wonderful views from the terrace of the restaurant – with something to keep the whole family amused! – whilst inside there are multiple dining areas to choose from including the conservatory for great views and the snug room with wood-burning stove. 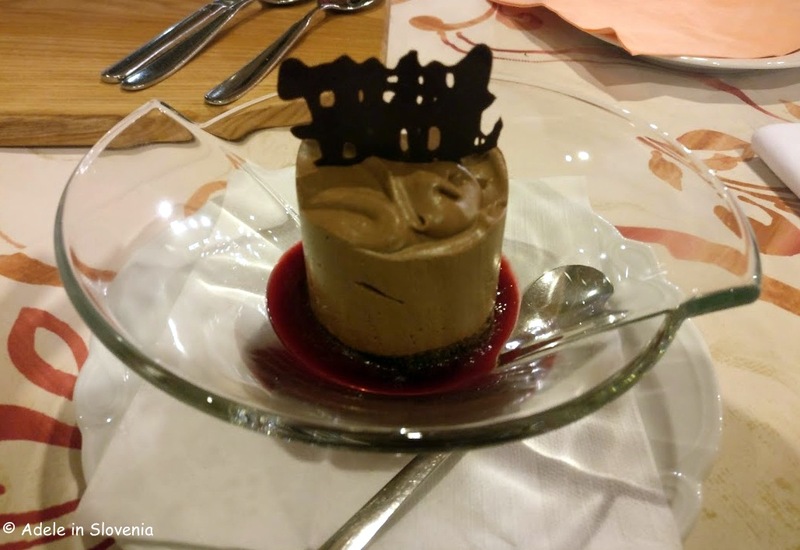 On the recommendation of the owner, Boštjan, I plumped for the Tasting Menu which comprises a choice of two 5-course menus of homemade delights. Cold starters are pheasant pate with homemade bread – fresh from the clay oven, or venison carpaccio. 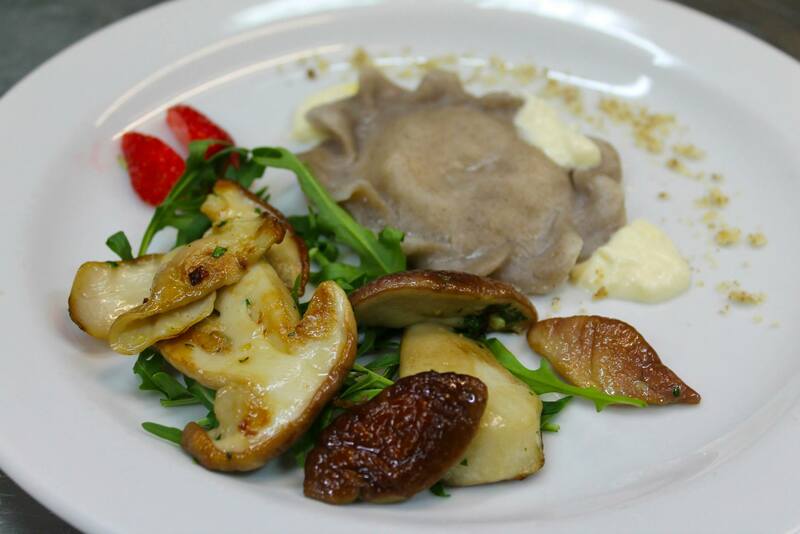 For the hot starter I chose buckwheat ravioli with porcini mushrooms. Garlic or beef soup was followed by roast pork or foal (can’t quite bring myself to eat the latter! ), and the dessert – chocolate dream – was a triumph, and certainly something to dream about! Gostilna pri Boštjanu is also particularly known for it’s St. Martin’s Day feast (Martinovanje). In November every year St. Martin’s Day, when grape juice matures into wine, is celebrated throughout Slovenia – even in non-wine growing areas (any excuse for a celebration! ), with, of course, wine, and typical dishes such as roast goose or duck with red cabbage and mlinci (a kind of thin, shredded flatbread). Reservations, especially at weekends, are essential – this place is hugely popular, for good reason, too! « Taste Radol’ca 2017 is Go!